Finola Finlay and Robert Harris feel fortunate to live in one of the most beautiful places on earth: Roaringwater Bay in West Cork, Ireland. In this blog we will explore landscape, archaeology, history, music, language, architecture, food, culture and local events to give our readers a sense of what life is like in this wild, remote, but surprisingly sophisticated place. This is us, taken by Shay Hunston as part of his People of the Wild Atlantic Way series. We love to hear from you! Leave a comment, question, or suggestion in the contact box below or, if you prefer, in the comments section at the end of the page. We promise to respond. Nice to hear from you, Patrick. I have responded by email. Hi Finola, I wanted to ask a question about your article on O’Donovan Rossa – The First Terrorist? But the comments were closed, so I am asking here. I am a researcher with Highlanes Gallery Drogheda, and we would like to use the mugshot of O’Donovan Rossa (in prison garb) included in your article, and I would like to know what collection you sourced the image from so I might ask them for permissions. Hi Karl. I will check and get back to you asap. Interested in one of your photos for a print project for small publisher in Chicago. Please let me know how to contact you directly. Thanks! I tried emailing you but the address was rejected. Please supply a working email address and I will contact you directly. Hi Finola and Robert, I absolutely love your blog. 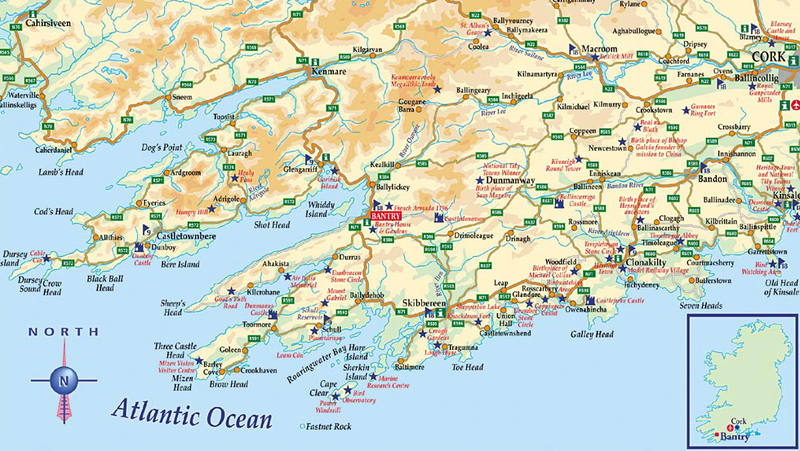 It’s full of interesting posts and helpful information on West Cork. We live in East Cork but love to camp and take trips to your area whenever we get the chance. Our daughter and her husband and children traveled from Derry to meet up with us last year in Barleycove and we had a lovely time there and in Skibereen. Looking forward to dipping in and out of your blog over the next few days, thanks for sharing. Hi again, Jean. Thanks a million! We don’t get to East Cork much but it figures in our plans. Did you see Robert’s post on Cloyne? What a wonderful little place! No, I haven’t seen that one yet. I’ve only been through Cloyne a couple of times. It looks a nice place. I’ll have a read of Robert’s post, thanks. Lovely to read your posts about the area, great documents. Thank you, Agnes! Lovely to get your comments. A fantastic blog – Many thanks for your wonderful images and insights. hopefully this does not sound too naive, but is there a way to visit and stay in West Cork, the land of my ancestors, hike all of these fantastic trails you write about, see all of these ancient sites, visit this land of stories, by living inexpensively in a local accommodation… not a B and B or hotel. Is there a way to be in West Cork with lots of time, almost to live there, and have the time to walk her fantastic path? Hello, We have enjoyed Roaringwater Journal for a couple of years now. One of us has O’Driscoll ancestry. We’re coming to West Cork for the third time (staying in Baltimore), Sept 12 and leaving Sept 17th. One thing we are interested in doing this time if possible is seeing some west Cork rock art. Do you ever take groups out? Or is there a source of GPS coordinates to sites such as Derreenaclogh or Ballybane West or Gortbrack? Thank you. Is your rock art thesis available? Just got back from Derrynablaha and interested to follow up. Roaring Water Journal is amazing. I grew up in Durrus so The journal and Durrus history are fascinating. The photographs and information are great. It’s a labour of love obviously. Hi Val. Lovely to hear from you and thank you for your kind comments. Indeed we do love doing the blog. We’re also fans of Durrus History and we were delighted to meet Pat, the blogger behind it, recently. HI Finola, I left a note on your CIrcus post this morning. just to follow up. I lived in Kilcrohane for 3 years with my wife and 2 daughters and moved back to the US in 2010. Miss it so…..
Great to hear from you, EJC. So glad you like Roaringwater Journal. Your photographs are stunning – and of course I recognise West Cork in some of them. Kilcrohane is one of our favourite places – we spend a lot of time on the Sheep’s Head with friends. Come back soon – it’s all still just as wonderful as you remember it! You have a great blog. I frequently research the Schull and Goleen areas as part of my genealogy quest. I’ve also visited the area twice–and look forward to coming back. You do much to convey the beauty, rich history, and sense of community of this region. I enjoy the variety of your posts and excellent photos. I’m glad I discovered you through the West Cork History blog. Thanks for bringing this to us. Thank you, Maureen, for your welcome comment. As you can see we just enjoy living here so much… Look us up if you are passing through. Thanks for that comment. So glad you like our blog. I so enjoyed your review of “White Goats and Black Bees” by Donald Grant! I found the book at our annual library book sale. It is always exciting to find these old books and I was fascinated by the descriptions of life in Dooneen. I also raised dairy goats and other farm animals and it brought back memories of those wonderful years. I love this book! I was researching the author and his wife and saddened to read in your blog they have passed away. I will enjoy this blog and learning about Ireland. Thanks for your comments. What a fascinating couple they were. I also heard from Donald’s niece who lives in Alaska. They are remembered in Kilcrohane – I was there the other day and the artists’ and growers’ co-op has copies of their book and we chatted about Donald and Mary. Gosh – one of these days we might actually meet in person! Elizabeth and I enjoyed meeting Monday. Love the blog. See you soon, we hope. So glad you are enjoying the blog, Chris. Great to meet you two! Hi, I found your piece on Cloyne very interesting as it is my family’s roots. I believe I was there in 2000 and the Round Tower was still accessible; many of my ancestors are buried in St. Coleman’s Cemetery. It appears that as many Catholics are buried there as there are non-Catholics. Hello Carol. Good to know that the tower was still accessible in 2000. And good to know that the churchyard is multi denominational! Just read your blog on my Uncle Donald and Aunt Mary Grant. I love Uncle Don’s book as well and miss them both. Thank you for sharing on your blog. Great to hear from you – have responded by email. We’ll be in Ireland for the month of June and making it down to West Cork for a couple of days June 4 -7 (staying at Henry’s near Clonakilty). Looking forward to visiting some of the spots mentioned in your wonderful journal. So much to do and see! Wonderful! Have responded more fully by email. is this stating that unconsecrated Catholic (stillborn) babies were buried in Protestant churchyards? if so, how widespread was this? Delighted to discover your articles on West Cork. I can see that you have an appreciation of heritage and history, in general and West Cork in particular. It is presented well. I will be following this in future. Its poignant for me to see the info on Ballydehob as we, the Barry’s lived there decades ago – and I spent my formative years there. Also the article on the Schull and Skibereen Railway: I gave the lecture there on the bridge on the occasion of the centenary in 1986. And we are delighted to ‘meet’ you, Michael! Thanks for following our journal. Let us know if you are ever in this part of the world – it would be great to meet up and share our enthusiasm for this place. I just recently discovered RoaringWater – absolutely love it. Just introduced my brother in England. I live in Philadelphia – originally from Kerry. Thanks much, as this is my favorite place and I love the various things you post. Hope to be back in 2014. Looking for a WWOOF type accommodation in the area. Hello MM! Thanks so much for the follow. Love your blog and your photos. Hope you’ve had a great time, Ingrid!